Summer entertaining season is here. Decorate your outdoor space with vibrant colors and extraordinary decor. Make your patio or yard the perfect place to hang out with your family, friends and neighbors. Ditch those tacky aluminum lawn chairs and dress up your outdoor space with unique furniture pieces. Check out this five-piece Baleares outdoor lounger from Frontgate. Available for $1,995, this set features four all-weather wicker pieces (a settee, round ottoman and two curved chairs), plus a privacy canopy to block the sun. When fit together, they create a cozy daybed for snuggling with your sweetie. Take down the canopy and spread the pieces out to create extra seating for an outdoor party. This lounger includes plush cushions and five throw pillows. Add brightly colored tablecloths, bold dishes and other vibrant accessories to your outdoor dining table. 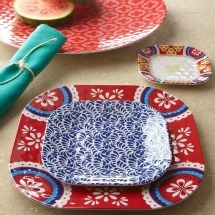 You can find colorful tableware almost anywhere, from Walmart to Pottery Barn to your local department store. If you are shopping online, check out Horchow. I love their Montecito melamine dinnerware. Twelve dinner plates are priced at $120. Horchow offers plenty of other items for your outdoor space including fountains, furniture, planters, sculptures and other decor. 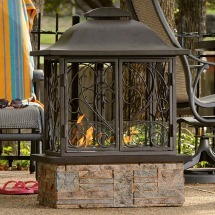 An outdoor fireplace doesn't have to be built-in or expensive. In fact, you can find some really attractive portable units that are affordable too. The Southern Enterprises Taos portable gel fuel fireplace from Hayneedle is very stylish. 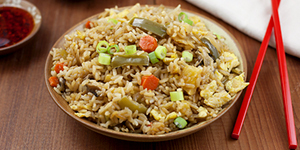 It emits no ash, odor or smoke, and can be used indoors and out. Priced just under $300, this fireplace is quite a bargain. 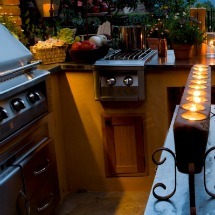 If you are big on entertaining outdoors, it's time to add an outdoor kitchen. Why go inside to prepare the food when you can stay outdoors and in the company of your guests? A basic outdoor kitchen features a grill, refrigerator and sink. You can make the kitchen as simple or as elaborate as you'd like. Spend your lazy summer afternoons relaxing in a soft hammock in bold tropical colors. 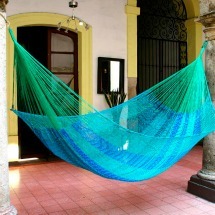 I love the collection of hammocks available from Novica.com. Grab an icy glass of lemonade and a good book, and escape to your own backyard. The Cool Lagoon hammock is priced at just $70. 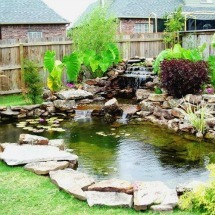 Turn your backyard into a relaxing sanctuary by adding a water feature. Water features can change the whole look and feel of your outdoor space. You can select a fountain, pond, waterfall, bird bath or a number of other water elements. The soothing sounds of water can be very calming. If you are lucky enough to have a pool in your yard, add a cabana poolside as a place to relax, dine alfresco or just get out of the summer sun. 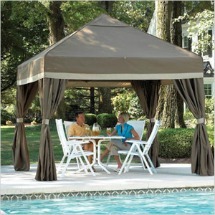 Even if you don't have a pool, a gazebo is a fantastic option. If you watch HGTV, you know cabanas and gazebos can be very pricey. However, they can also be simple and relative affordable too. 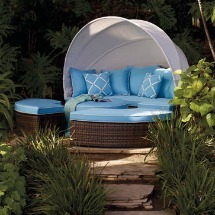 You'll love the Cool-Off pop up cabana that you can set-up in just a few minutes. Add interesting lighting to your outdoor space such as tiki torches, hurricane lamps, hanging tea lights, strings of lights and more. I love the assortment of paper lanterns from World Market. 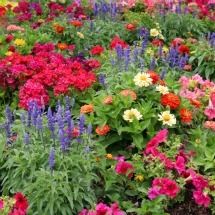 They are an affordable way to add color and light to your yard or patio. 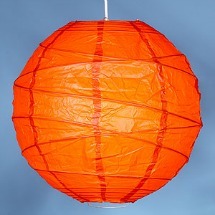 These gorgeous round orange paper lanterns are just $7 each. If you have the space, use pavers, bricks, stones or tiles to create a walkway out to a gathering place in your yard. You can arrange your outdoor furniture here with a water feature or fireplace as the focal point. Also consider adding benches, garden walls and sculptures at various spots around the yard as additional design elements. 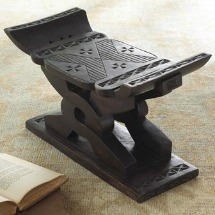 You'll love this unusual Nyansapo garden seat, available at Horchow.com for just $165.